Five months pregnant, Amanda Adams and her husband were given two abysmal choices regarding her pregnancy: force her baby to fight for his life through countless invasive and dangerous surgeries, or perform a late term abortion. Despite the fact that Liam was missing half his heart, Amanda chose life. Amanda's emotional plate was full as she found herself redefining the usual expectations a mother has for her child. Instead of wondering where he'd go to college, she wondered if he would survive his first birthday. The eventual acceptance of Amanda's grief helped her accept her new role as a powerful advocate. Over the course of seven years, together, as a family, Amanda and her husband helped Liam endure twelve heart surgeries, each time taking him to the brink of death. 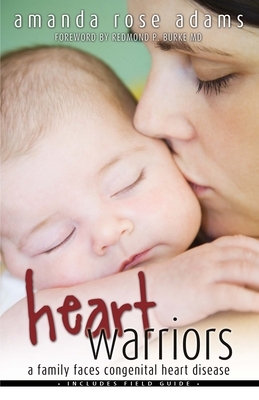 Heart Warriors is Amanda's personal and emotional story that initiates a powerful dialogue about infant mortality and hope. Includes a Parent's/Family Field Guide. Amanda Adams is a "Heart Mom" and a powerful voice within the CHD community by working closely with cardiologists, cardiothoracic surgeons, and nurses from Harvard University, Baylor University, University of Southern California, University of Illinois, and CU Boulder Medical. She founded two 501 c3 nonprofit organizations for CHD, organizes medical conferences for Hypoplastic Right Hearts, attends medical advisory board meetings and national chapter presidents meetings for the Children's Heart Foundation, and chaired the Congenital Heart Walk in Colorado. As a pioneer of CHD advocacy, she is also firmly rooted in the social network of CHD parents and survivors. Amanda has done several press interviews and addressed a variety of audiences on behalf of the American Heart Association, including her speech to over 10,000 walkers and the press for the 2006 American Heart Association Heart Walk in metro Denver.